If you do not find your questions answered here, please contact us. We look forward to helping you with all your questions. You are welcome to make your purchase through our website or over the phone by calling either 415-982-2213 or 1-800-924-2213 during our business hours, Monday through Saturday, 10:30 am to 5:30 pm pacific time. If you plan to pay by Layaway or use multiple credit cards please call us for help with your order. We accept all major credit cards, including American Express, Visa, Mastercard and Discover, Paypal and bank transfers. We are also now offering pay over time financing. We DO NOT accept cashiers checks, personal checks, money orders or western union. For internet purchases, we are only able to use multiple credit cards if all cards have the same billing address and you are ordering by phone. You will be charged 8.5% sales tax if you live in California. If we ship outside of California there is no sales tax added. No California tax is charged on international sales. Each piece is shipped beautifully gift wrapped with our signature gift wrap in a velvet lined jewelry box or pouch. Engagement rings are presented in a velvet lined jewelry box and wrapped with ribbon only. We offer FREE FedEx shipping on purchases and returns. Items less than $10,000 include FedEx 2nd Day shipping and items over $10,000 include FedEx Priority Overnight shipping. All FedEx deliveries require a signature upon receipt and are fully insured for the full retail value. Our insurance requires that someone must be at your address to sign for the package on the delivery date. If there is any deviation from these delivery guidelines, there is no insurance coverage. Your package will be sealed with clear tape over the top of the box and around the flap closures. Please closely examine the package upon receipt. If there appears to be any sign of tampering, do not accept the package and contact us immediately. We also offer free USPS registered insured or Express shipping if your address is not accessible via FedEx delivery. Please make sure to check that your package hasn't been tampered with prior to accepting delivery. If you find that something has been opened DO NOT accept the package and please contact us immediately. We insure every package for the full value of the piece. Our insurance requires that someone must be at your address to sign for the package on the delivery date. If there is any deviation from these delivery guidelines, there is no insurance coverage. Your package will be sealed with clear tape over the top of the box and around the flap closures. Please closely examine the package upon receipt. If there appears to be any sign of tampering, do not accept the package and contact us immediately. Can I upgrade to Priority Overnight shipping? Saturday delivery? On purchases less than $10,000, we offer free FedEx 2nd Day shipping. If you would like to upgrade to Priority Overnight shipping you can upgrade for $30. If you would like Saturday delivery, you can upgrade for $20. If upgrading from FedEx 2nd Day to Priority with a Saturday delivery it will be $30 plus $20. Once you have placed your order, we will contact you prior to shipping to make arrangements. Since a signature is required, we always contact you prior to shipping to confirm that you will be available to receive the package. Orders must be placed by 2 pm pacific time to be eligible for Priority overnight shipping for next day delivery. You will receive an email from our shipping department with your tracking information. Yes, we do ship internationally. We use FedEx International Priority shipping and all international shipments are $110. Not all locations have shipping available. Each country has a specific insurance limit so please contact us if you would like a package shipped internationally and we will determine if it is possible. At this time we cannot ship to France. APO addresses have an insurance limit of $5,000 and must be shipped via USPS. We are not responsible for any local customs or duties you may incur upon delivery. If you pay by credit card, we are only able to ship to the billing address on file with the bank for the credit card. If you are paying with an American Express card, you may call American Express to add a secondary shipping address. Please call us with the alternate address and card information and we will verify the secondary shipping address with American Express. We can only ship once we are able to verify this address with American Express. If you are paying by bank transfer, we are able to ship to any address you choose. Additional shipping charges will apply if the address is international. In Store: You have 10 days to return your purchase for any reason. Exchange for store credit only within 30 days. All sales are final after 30 days. No exchange or refund for jewelry which has been worn, altered or damaged. Online: We offer a 10 day return period to return your purchase for any reason. We understand it is a difficult decision to make a purchase online without having first seen the piece in person so you are welcome to return the jewelry you purchased for any reason for a full refund. However, please contact us to alert us of your return. We will make a note in your customer file and email you a prepaid return FedEx label. The 10 day return period starts the day you receive your order and returns must be shipped by the 10th day. We will refund the purchase in the same way as you paid initially once the item is back in our store and has been inspected. We will only accept items for return that are in the same condition as when they were shipped. If you notice any problems with the piece upon arrival please call us right away. Layaway: All sales are final. Final payment is due no later than 90 days from the date of the initial down payment. If you are interested in a layaway please be aware that you will have to agree to a NO RETURN policy. If you cancel your layaway prior to full payment, all payments already made will become store credit. Please phone us to start your layaway. You have 10 days from the time your package arrives to return your item for a full refund. All returned jewelry items must be in the same condition as was sent to you. No jewelry will be accepted for return if it is damaged, altered or worn. Do you charge for ring sizing? The first ring sizing is complimentary and takes about 2 weeks. We do not rush ring sizing, but can try to make accommodations when necessary. Most rings can be safely sized up or down one full size and sometimes more. It depends on the style of the ring and what size the ring is and needs to be sized to. We will only size a ring when we feel that it will be a successful sizing. We do have some rings, including all eternity rings with gemstones going all the way around the ring, which we cannot size and some rings that are too delicate and we will not size. This will be noted in the description. Can I return a ring after it has been sized? You are welcome to return your ring after it has been sized, however we will charge you our cost for sizing upon return. If the ring needs a large adjustment, we prefer to ship the piece as is first to make sure you want to keep the ring. We will then arrange to ship the ring back to us for sizing and then ship back to you once it is finished. Can you provide additional information about your sizing process? Most rings can be sized up or down one size unless noted and sometimes can be sized more. Keep in mind that most rings were made to the scale of the size. Large rings are usually too broad across for a small finger and visa versa. Feel free to contact our sizing department to discuss any ring you are considering. Please include your phone number so we can gather information to best size you. If you provide us with an incorrect size there will be an additional charge for the second sizing. We have a team of highly skilled jewelers who specialize in restoration of antique and period jewelry who are experts at sizing. How long does it take? Sizing a ring takes 10 working days plus or minus. When a ring is made larger we typically cut the base of the shank and add metal. We quality control all our sizings with a microscope and you should not be able to see where it was done. When a ring is made smaller a piece of metal is cut from the base of the shank where it is then soldered or fused solid again. We use traditional as well as modern techniques in the process including Lasers for platinum welding. We take great pride in the work our jewelers do and quality control all work with a microscope. If for any reason you have a problem resulting from the work we have done, we will correct it. We do not guarantee work performed by other jewelers. Can you size a ring I didn’t purchase at Lang? We only size rings purchased at Lang. 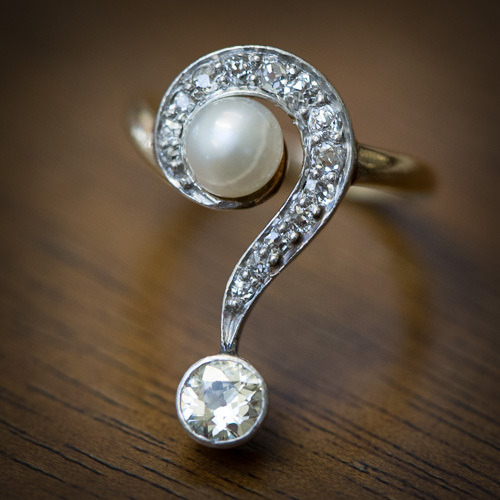 All our vintage pieces have been thoroughly inspected by our in house gemologists and our jewelers and determined to be in very good to excellent condition. For the first six months after purchase we include some common repairs that may be necessary. Jewelry must be inspected and professionally cleaned every six months so we can identify problems before they result in stone loss or irreparable damage due to improper wear. We provide this service at no cost to our local customers. If you live outside of the Bay Area we are happy to help with this service, but shipping fees may apply. We will repair jewelry for a fee should you damage your piece. Any work done on your piece by any other jeweler voids our guarantee. Please review our repair policy page for all information regarding repairs. Is this item available for purchase? All of our items have prices listed and are available for purchase in our store in San Francisco, by phone at 1-800-924-2213 or through our website. If you see a price, the item is available. We update our inventory constantly so there are only very rare occasions when an item is sold in the store and has yet to be taken offline. If you are browsing our Archive section, those items are NOT available for purchase and are marked as ‘Sold’. We do not provide pricing on pieces that have sold. We have a very special collection of jewelry at Lang Antiques. Our carefully curated selection of antique, vintage and estate jewelry features rare and mostly one of a kind items typically ranging in date from the 1850's to the 1950's. We lovingly restore pieces as necessary and only sell pieces that are in the best condition possible for another lifetime of wear. We price our jewelry competitively without room for discounts. We know other jewelry stores may operate in a different manner, however given the unique nature of our jewelry our prices are firm. We offer a 3% discount for purchases paid for by bank transfer. Included with your purchase is a detailed sales document for insurance purposes, one free sizing (if it is a ring) and our guarantee. Do you offer a layaway plan or financing? We no longer offer a layaway plan, but we do offer financing. Check out our financing page to check your rate. Can I buy just the setting/diamond? Do you sell settings? Our utmost goal is to keep the integrity of our vintage and antique pieces so we do not sell the mountings without diamonds or just the diamond that is currently set into a ring. Antique and vintage settings are very rare to find in good condition and even more so in a particular style and size you are looking for. We suggest working with a jeweler to make a mounting for your gem. You are welcome to print out photos from our website as inspiration, but we are not custom jewelers and therefore cannot provide this service. Do you restore your jewelry? It is not unusual for jewelry that has been worn for 75 years or more to need some restoration and refreshing. We restore our pieces to the best possible condition so that they are ready for another lifetime of wear. Our jewelers are experts at working with vintage and antique pieces and use the most appropriate techniques according to each piece of jewelry. In some cases, we leave the natural patina because it is appropriate for the piece. We make sure that all gemstones are tight in their mountings and that all mechanisms work properly. Do your diamonds come with GIA/EGL reports? Some of our items are accompanied by a lab report, but not all. It will be clearly stated if there is a report with a particular item. We do not go out of our way to remove diamonds from their settings to obtain GIA reports unless we feel it is absolutely necessary as we like to maintain the original quality of our pieces. We guarantee our grading and grade our diamonds according to GIA standards using GIA master color diamonds for color grading. All our diamond grading is done by GIA graduate gemologists and at least three gemologists look at each piece. All the gemologists that work in our lab are seasoned appraisers with more than 100 years of combined experience. Some of our gemstone pieces are accompanied with an independent lab report from accredited gem labs, such as AGL, GIA, SGL or others. The reports may state treatments, or lack of treatments and possibly the origin of the gem. Not all of our pieces are accompanied by a lab report. Unless noted, it is assumed that most gems we sell have minor, stable and routine treatment including heat for rubies and sapphire and oiling for emeralds. We do not sell gems that have unstable or extensive treatments. All of our jade is natural, untreated jade unless noted. We provide a point of sale report upon purchase. This report will help you to get your jewelry insured. We send the document as a .pdf file to your email address and it takes about a week after purchase to arrive. Please contact us if you have not received your document in a timely manner. Can you recommend an insurance company to obtain insurance on my purchase? We recommend contacting the insurance company you have policies with first, but if you do not have any insurance, our recommendation would be Jewelers Mutual Insurance. We have pamphlets available if you would like one included with your shipment. How do I take care of my vintage or antique piece?